we only have seating for 150, so reserve you seat today. The dinner is the Boodle Fight, which is a mixture of Filipino traditional foods, BBQ chicken, pork, pancit, lumpia, rice, seafood, vegetables and a surprise, homemade Halo Halo at the Sari Sari store. 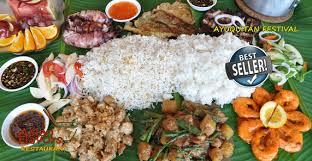 From my experience during my compulsory military training, a “boodle fight” is the Philippine Military jargon for a mess hall banquet where all the food are piled into one big tray in each table and every soldier, enlisted men and officer alike eat from that same tray with their hands as a symbol of camaraderie, brotherhood and equality in the Armed Forces. The “fight” part refers to the fact that it’s every man or women for themselves during these feasts, this means you grab and eat as much as you can before the food runs out or else go hungry because everyone else is gorging away. Food typically is placed if not on a food tray then on banana leaves or old newspapers, you eat using your bare hands, so jugs of water are put on the side to wash hands before and after the eating combat. Total Body Fitness is dedicating the 2017 race season to give the gift of Shoes.